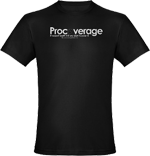 Procoverage is a film team based in Las Vegas that participates in various online film contests and festivals. Much of the group is comprised of former Art Institute students who love filmmaking. Bryan, the leader of the group, has had one short film featured in the Phoenix Film Festival 2005 that featured four members of the group. With a love for storytelling and humor, Bryan has spent almost his entire life studying various arts from video, to writing, to graphic design.